construction yard to your base repair it and then deploy for NOD technology. cyborgs to guard the commander by selecting them and pressing G, and destroy them. receed about as fast as it took to grow. No more chemical missile attacks! behind because he gets in the way of your shots and dies. If you use GDI, do the same way, but keep away your harvester while you're attacking! will follow the path your unit(s) came from and find your base. step when you see blue tiberium. If you place pavement on top of a crater you can then build on top them. or an unwanted valley will be created! This does not work on mountains. he is about to throw tell him to fire across the map and he Will. Those Arms must really be good. send them into the enemy base. Enjoy. When playing as GDI, you can build structures that can be upgraded, ie. powerplants. that you will lose is the money that you spent on the upgrade. regular infantry will die if they are ordered into Tiberium. player if there are alot of bridges. your Multi Missle at your opponent's Construction Yard, which should destroy it. Viceroids. The Viceroids will destroy most of the surviving buildings. The easiest way towards victory using an air assault is to take out the SAM sites. team is NOD, you will first have to disable their power plants. capture. Should he fail, sell the building for an easy profit. dies. Be careful though, once they become adults they are not friendly. Take a Mutant Hijacker in to a city and find a Car, truck or a bus, and select it. Now you have control over the Vehicle. They are used as transports. Blam! All of your problems are solved. will not run out of power until you build or turn on your power plants. units on that base. After that distroy all the powerplants. So the NOD has low power. the map there is a base you can capture. capture it and distroy all NOD units. unload the engineers and capture the base. next tip to finish off the level and everyone after it. fire toward your target (not at the target. Aim for the ground in front of it). The discs will bounce off of the ground and if you aimed right, hit the target. pavement somewhere else and then moving your mcv back. the engineers and capture the base. Before conquering a base,Build a defencing structure(Let's say Obelisk of Light). waa laa what happens next is up to you. free the mutants. Then take the level where you have to destroy the supply base. the nod base u encounter b4 the 2nd generator, and one to take over the refinary. them and happy killing the generator! else to do, you can watch the missile dissipate in the Firestorm wall. Wall while it is activated because they will be automatically be destroyed. areas. Veins also have no effect on infantry and Harvesters. Sometimes when you scroll into the black shroud the "Unrevealed Terrain"
in any mission, but will usually will occur on slower computers. him will be killed as well. screw the whole thing up if you're not careful. is 1024 x 768 or higher. Wall will remain on indefinitely unless you build or turn on your power plants. 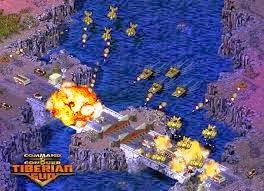 with the Firestorm Wall at a distance from your base, backed up with RPG Launchers. to assist destroying the aircraft. mature Tiberium, use something that creates an explosion, such as a Disrupter. massive damage to the field. infantry units. Retail price for all these units is 2000 credits so you save 50%. Take a harvester and fill it with blue tiberium, then put it in your enemy's base. If you are playing a Multiplayer Skirmish, build up about 10-20 artillery. Mobile Sensor Array along with the artillery. the amount of infrantry each one can carry. When playing as GDI, you can build structures that can be upgraded, ie. power plants. Take a group of bombers and destroy your enemy's Construction Yard and War Factory. Then, if you have ammunition remaining, hit their Tiberium Refinery. wil charge after few minutes. Life Left, send Them On Any Tiberium Fields, They Get Back life after some time. it, as it will be needed later. After that, keep going and you should see a "ramp"
leading upwards. Go up and you should find a small base. Do not damage any buildings. base. You will get three Sergeant Light Infantry and three Engineers. and repair it. There may also be some Light Infantry there as well; defeat them. the mouse. Note: This requires some practice. harvester locked out. In the end they will just sell their items one by one. into Mutians. The more men you change, the better. placing it next to the Construction Yard, and watch it blow up. is accessed this way... First rescue all 10 mutants in 'Rescue the mutants' mission. Oh yeah, don't forget to get Ghost Stalker and Mutant Hijacker in that mission!! take some units and proceed to the upper left corner of the map for a small surprise. the Juggernauts will weaken it and allow the Ghoststalker to finish it off. Build a Subterranean APC and fill it with Engineers. Send it in the enemy's base. MK.II and a Ghost Stalker in between. Nothing should be able to penetrate. resolution of 640x480x16 to a resolution of 640x400x16 and what do you get? more on your sidebar of course. Construction Yard or Temple of Nod or Upgrade Centre which would be annoying. sections, turn on the Firestorm Wall Generator to kill it easily. If you want to get rid of vein hole monsters, do not use anything with a cannon. the cities until you uncover the whole city. Tell your unit to go behind the building. first select to free the mutants. Then during the "Destroy Chemical Missile Supply"
mission, instead of destroying all the chemical tanks, go northwest to find a train. you. Complete the new objective by getting the Ghost Stalker on the train. Then, destroy the rest of the chemical tanks. other sides to give further protection.